In 2015 investors had to contend with a very volatile equity market during the summer months. On August 24, 2015 the Dow fell 1,000 points intraday before closing down 588 points. This volatility extended into October with the end result, the S&P 500 Index was up only 1.4% for all of 2015. This level of volatility and flat returns left investors anything but bullish going into 2016. As fate would have it, investors faced another market decline to begin 2016 as the S&P 500 Index fell 11.4% before bottoming on February 11, 2016. 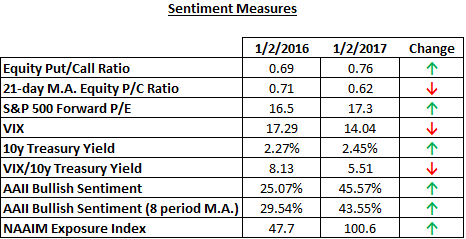 Fast forward to the end of 2016, and after an equity market that returned 12.0% for this past year (S&P 500 Index), broad measures of investor sentiment are much less fearful as 2017 begins as can be seen in the below chart and raises the question whether much of near term returns are already priced into the market. The evaluation of the bottom three indicators in the above chart leads one to possibly conclude individual investors (AAII) and fund managers (NAAIM) just might already be positioned for strong equity returns in 2017. 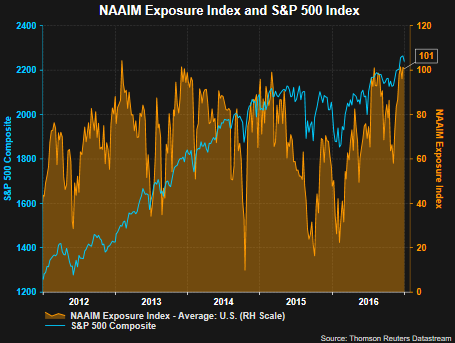 As noted on NAAIM's website, the NAAIM Exposure Index represents member firms who are active money managers and are asked each week to provide a number which represents their overall equity exposure at the market close on a specific day of the week, currently Wednesdays. Responses are tallied and averaged to provide the average long (or short) position of all NAAIM managers, as a group. A reading of 100 for the average indicates managers are fully invested. 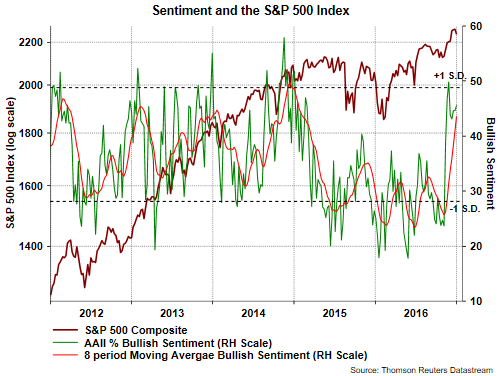 With respect to individual investor sentiment, last weeks AAII Sentiment Survey reported an increase in individual investor bullish sentiment to 45.57%. 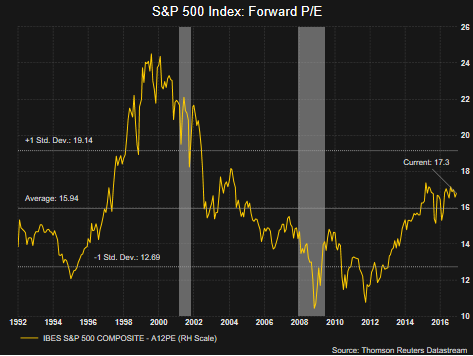 This contrarian indicator is nearing a level associated with near term market tops. As the below chart shows, elevated sentiment levels can be worked off with a sideways market action versus sharp downward corrections as was the case in early 2015. In conclusion, investors seem to have a broadly favorable view of the markets going into 2017 and this may be the reason for some caution. I believe some of this optimism is based on anticipated pro-growth business policies that may be implemented under a Trump administration. The key factor is a Trump administration is not in office yet and the exact policies that make it through Congress are unknown. From a positive standpoint, S&P 500 year over year (YOY) earnings have turned positive as reported by Thomson Reuters with actual Q3 2016 earnings up 4.3%, ex-energy S&P 500 earnings up 7.9%. Q4 2016 earnings are expected to be up 6.2% and Q1 2017 earnings up 14.1%. This accelerating growth rate in earnings should certainly be positive for stocks with valuations just slightly above average.